This is my second post today. Scroll down to see how I used some scraps to make a cute card for my Creative Critterz Imaginations Design Team project. Today is the day for another design team post for Craft Junkie Too! This week's task was to make "Something Egg-stra Special" with an Easter egg on it. 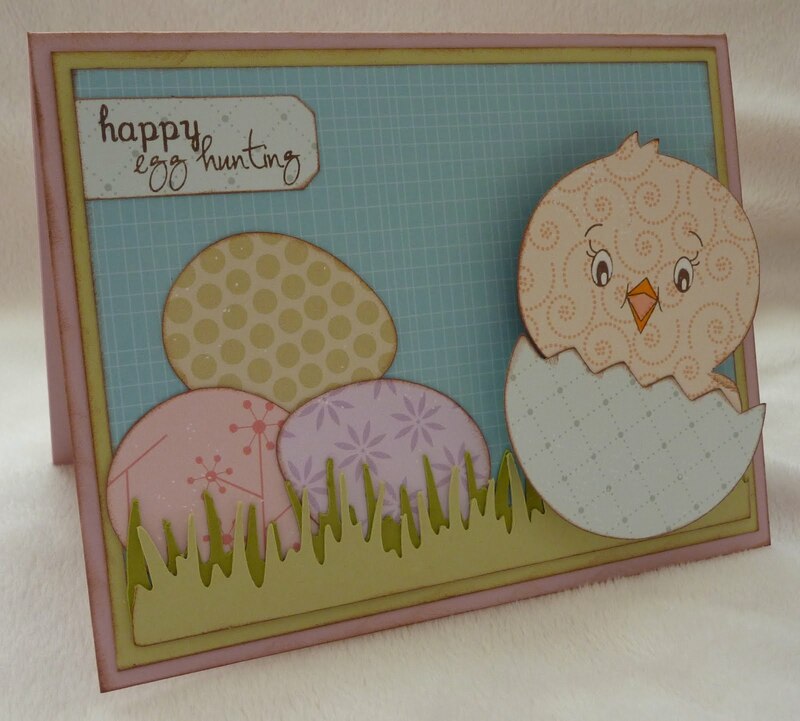 Be sure to stop by Craft Junkie Too to see what Tracy, Amber, and Cheryl have created for you this week. For my project, I made an Easter card for my brother's family. My sister-in-law likes to use my cards as part of her holiday decorations, and she was whining about not having an Easter one (just kidding, Becky)! The grass on the card is made from two 1" borders of grass from the Martha Stewart Seasonal Cake Art cartridge, welded together on my Gypsy. I cut this twice and layered it, in two different shades of green. The eggs, sized at 4.4" and 4.75", are from Doodlecharms. I decided my chick needed to be on an Action Wobble so that my little nephews can have fun with him. He and his shell are cut at 2.75", and I hid his facial features on my Gypsy so that I could use a Peachy Keen stamp. You can still do this without a Gypsy, but cutting him with the "blackout" feature. 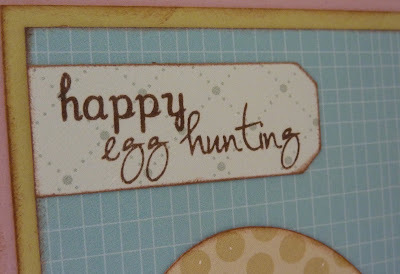 Lastly, I used one of my new Papertrey Ink dies for my sentiment tag and stamped it with a cute sentiment from My Creative Time's "Color Me Happy" stamp set. This set is PERFECT for Easter! 8 1/2" x 5 1/2" Papertrey Ink Lavendar Moon Cardstock, scored at 4 1/4"
Really cute Katie!! Love it. 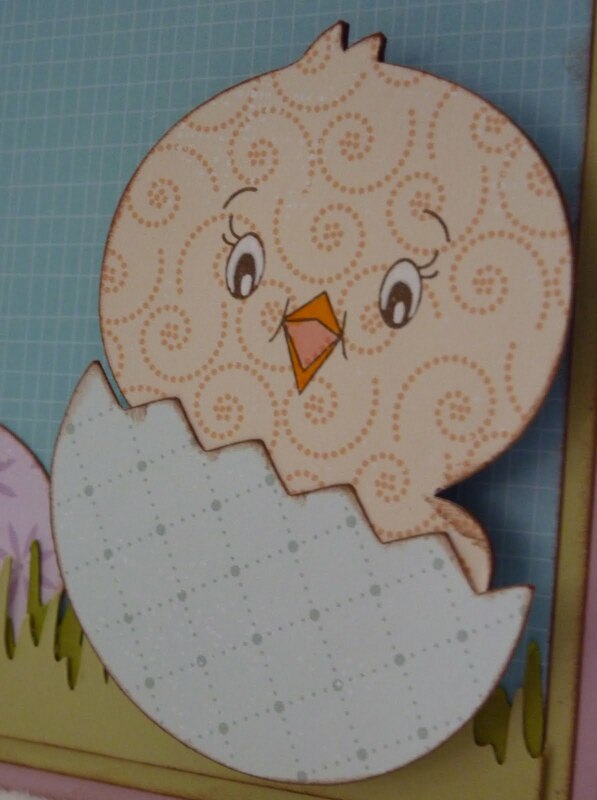 Love the chick in the egg, so cute! TOTALLY Adorable! Love all your pattern papers. TFS!--Pat N.
Thanks for sharing your adorable card! I love the little hatched chick on the wobble... I know my kids would LOVE it too! Totally ADORABLE! you know that I'm partial to the wobble! your inking is amazing! I just love it! This is really cute. Love it. I need to get some of the action wobbles, they are amazing.